Make a condominium in A Place at the Beach V your home away from home during a family beach vacation in North Myrtle Beach, South Carolina. The vacation rentals offered by A Place at the Beach V provide all that you will need to enjoy a memorable family beach vacation. These condominiums provide a comfortable resting spot that is just across the street from a stunning stretch of South Carolina shoreline. While staying in one of the lovely condominiums that A Place at the Beach V boasts you and your family can easily enjoy full days of family bonding time on the Atlantic Ocean as well as sample some of the many other exciting activities that North Myrtle Beach offers as you create your perfect South Carolina family beach vacations. The two-bedroom vacation rentals that A Place at the Beach V offers have all the creature comforts of home in an unbeatable environment. Enjoy ocean views from the private balconies that can be accessed from the living room as well as the master bedroom. These cozy condos are attractively decorated and, in addition to the two bedrooms, offer two full bathrooms. These second row, North Myrtle Beach vacation rentals offer enough space for a small family to simply relax and enjoy. Fully equipped kitchens grace all of the condos at A Place at the Beach V. These kitchens will provide all you need, with the exception of groceries, to prepared wonderful family meals. Kitchens have microwaves, coffee pots, pots, pans, utensils and dishes. For easy cleanup they also provide dishwashers. A kitchen is not the only convenience guests will find when they choose to stay in a rental on A Place at the Beach V resort. Guests will also have access to on-site laundry facilities and an outdoor shower where pesky sand can be washed away after days full of fun on the shoreline. Relaxation and entertainment is always a priority during any vacation and the condos of A Place at the Beach V provide amenities to assist with both. Each condo has a private ocean view balcony where guests can sit and enjoy a morning cup of coffee or evening glass of wine as they relax away from the stressors of everyday life. For entertainment the condominiums have multiple televisions, some flat-screens, which guests can use to keep up with their favorite programs or just to fill time on an unfortunate rainy day. Guests will also find wireless Internet access so devices can easily connect and keep vacationers connected. Many people vacation in North Myrtle Beach for the miles of stunning shoreline and the plethora of opportunity available for water fun. When you choose to vacation in A Place at the Beach V water fun is not limited to time spent on the shoreline. Just below these condos, on the resort, is a sparkling swimming pool that is surrounded by a sun deck with comfortable lounge chairs. If you want to enjoy the water but do not want to have to worry about the crowds on the beach, or washing sand from your swimsuit, you can lounge by the pool, perfecting your suntan and taking a dip in the refreshing water when you want to cool off. Additionally, guests staying at A Place at the Beach V also have access to an oceanfront sun deck with lounge chairs and a second sparkling swimming pool. Here guests can enjoy water fun without the sand while still enjoying a fantastic oceanfront view. With so many dining options so near this resort it is entirely possible that if you want to take a vacation from cooking you can easily dine out at one of the numerable restaurants that is near A Place at the Beach V. When you want to stay in however, and perhaps avoid crowds at the local eateries, you can make use of the fully equipped kitchens that these condos boast or you can head down to the grilling area that the resort offers, cook out and dine on the provided picnic tables as you enjoy a saltwater breeze. Visitors to North Myrtle Beach will find that the area offers a wide variety of attractions and activities to enhance vacations. The main attraction that calls people to the South Carolina shoreline and North Myrtle Beach are the miles of beautiful beaches along the Atlantic Ocean. Vacationers can easily fill days surfing, parasailing, kayaking or sunbathing. The Atlantic Ocean also offers the option of fishing or ocean tours. Another major attraction in the North Myrtle Beach area is the more than 100 golf courses where visitors and locals alike can book tee times. Vacationers will also find numerable shopping venues, award winning live shows and exciting amusement parks. 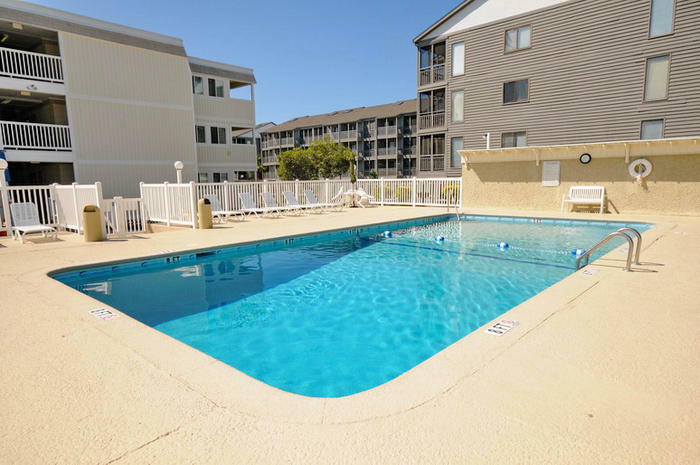 A Place at the Beach V will place you conveniently near all of the best that North Myrtle Beach has to offer while delivering accommodations that you will be pleased to call your home away from home.